The lamps arrived on time and well packed. Nothing was broken or chipped They are 27.75"high and they looks lovely in the bedroom but I'm not crazy about the alligator print. I must say, they definitely make a statement when you walk into the room. I would definitely recommend these lamps. 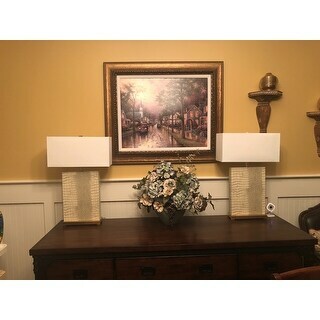 Beautiful lamps just didn’t flow well with my living room set and other decor. 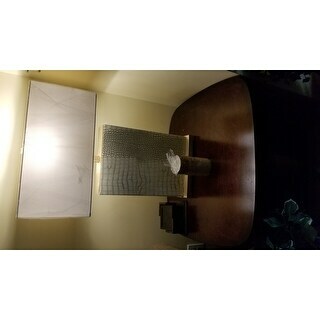 The quality of the material of the shade and the base is of good sturdy material. The lamp itself is of good weight! I highly recommend this item. I love these lamps, except.................. the color of the alligator is YELLOW (I expected a cream or off-white color). I'm trying to make them work because I love the style &amp; size of the lamp; very classy look........ but not sure the color will work. They really are YELLOW (like a greenish yellow), not anything like the picture (color-wise). These lamps arrived on time and were well packaged so no damage during transit. 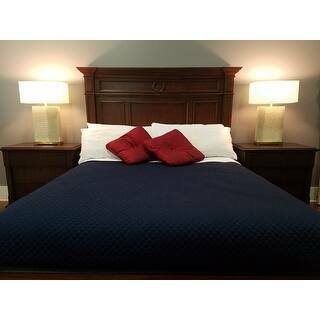 We purchased these in both grey and in cream and we think the cream lamps are much nicer. The gold coloured bottom of the lamp is quite a bright brassy gold colour so it works okay with the cream. We would recommend them in the cream colour. These look so high end. They are very tall and substantial when placed on our side tables next to the bed. We are from Louisiana and I love how I could incorporate alligator skin into our French Modern home without looking cheesy. My Stepmom loved them so much she ordered some for her house, too! Lights up the room, will make any room look a little more contemporary. Very sturdy and just an eye catcher. 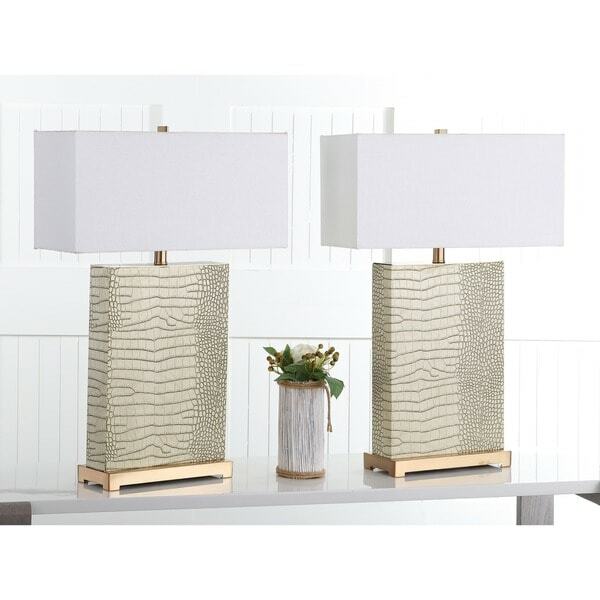 This lamp set is perfect for our (still being decorated) master bedroom. These lamps add a cozy ambiance at night. Gives the décor "interest" and texture. Arrived in excellent condition and timely. These lamps are very pretty, perfect size and look expensive. Unfortunately, I had to return them, they have a greenish accent to the leather which did not match my room. But I would highly recommend the lamps, just be aware of the coloring. I love the lamp but I don’t like the cream. It’s not really a cream color. The lamp itself is very big. Its bigger than what I expected but I love the presence on my nightstand. Beautiful! Just like the photos on line. I am very pleased. Exactly as described, arrived early, very happy with this purchase, exceeded my expectations overall. 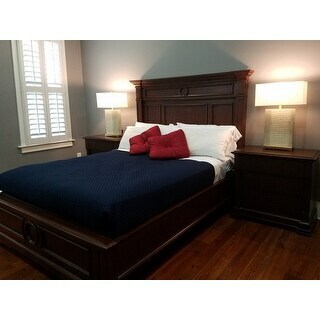 I would definitely recommend lighting fixtures and lamps from Overstock.com again n again n again. Beautiful product, just as advertised. Unfortunately, they only come in a set of (2). "What wattage bults can I use - will 60w/100w traditional bulb work ?" The maximum wattage for this item is 13 watts. Thought it would make a nice house warming gift for our daughter's first home. "Hi I like 2-know what color is the Faux Alligator Lamps the base ,is it light gold or beige or brown accents?" It is gold. Very pretty! I have it over a Moroccan credenza and it looks so classy. They are pretty large. Very tall, but narrow, so they look great on the credenza. I was not expecting the size.